Dr. Wayne Isom, surgeon-in-chief at Weill Cornell Medical Center in Manhattan, recently turned down a rather high-profile client to be able to hit the links. Isom was lounging at his vacation home in East Hampton when he received a phone call from a Westchester doctor asking if he could take an emergency heart patient who had requested him. When Isom asked who the patient was, the doctor on the other end of the phone replied that he was unable to tell. To this, Isom replied, "If you can't tell me, then I'm going to play golf." 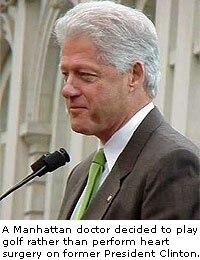 To his chagrin, Isom had just declined ex-President Bill Clinton. "Realistically, if they had told me it was him, I probably would have said, ‘ Sure, I'd be glad to do it,'" Isom told CNN. "I'm not a big fan of his, but, as they say, everybody looks the same on the inside." Who says that? Norman Bates? Generally, while doing these BadGolf world roundups, I take considerable effort to stay away from miniature and disc golf, simply because, with the overwhelming congregation of bumbling burnouts that partake in these activities, oddball stories are as ubiquitous in today's periodicals as Lumpy jokes (although I am guilty of many of them. Lumpy's just funny). But this one, I just couldn't pass up. 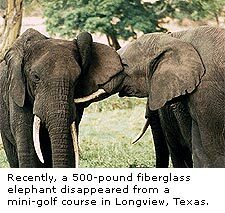 Recently, at least three – possibly four – suspects crawled through a hole in the fence at Putt Putt Golf & Games in Longview, Texas, ripped up a 500-pound elephant and a 10-foot tall pink giraffe that were bolted to concrete blocks buried in the ground, hoisted them over a 5-foot-tall fence and loaded them into pickup trucks before escaping into the night with their prized cargo. Overall, the fantasy safari scored $4,000 worth of merchandise, reported Manager Steve Barnhart, not to mention the fiberglass tusks of the elephant, which could go for an unprecedented sum on the mini golf black market. And apparently this is a family affair, as Barnhart also reported losing an infant elephant several times in past years, only to have it turn up beside the road or in some remote location shortly after the theft. Barnhart is estimating that the crime took at least 30 minutes to an hour to complete, which would rule out any suspected teenage stoners, as their average attention span is equal to the time it takes Lumpy to inhale a half-rack of ribs. (Ah, another one). In most cases, the suspects would have entered the premises, looked down at their feet, and began to intensely interrogate their toes on the mysterious disappearance of their shoes, forgetting the task at hand. Now on to Manchester, where it seems that they are now letting soccer hooligans onto the field and even giving them captain's bands. Paths on golf courses are not only frequented by carts but also recreational walkers out to enjoy the serenity exuded by the links. Sometimes, these pedestrians become entangled with the golfers, and altercations ensue. And every once in a while, they find themselves caught in a confrontation with other trespassers. Roy Keane, captain for the renowned Manchester United soccer squad, is the target of an investigation surrounding the physical assault of a 16-year-old boy. It is alleged that Keane, while walking his dog on Hale Golf Course, engaged in an altercation with the boy. The child's mother insists that her son beeped his scooter horn at Keane, only to prompt the stick-wielding Keane to try and knock him off. In a later meeting, Keane asked the boy, "Are you the guy who beeped me?" When the boy affirmed, Keane proceeded to grab him. When approached about the allegations by the media, Keane responded succinctly, blurting a vulgar comment to journalists who met him at the airport. I'm sold. Who could still believe a man with such proven patience could have committed this libelous nonsense? Now on to Wichita, Kan, where if someone says, "Let the big dog eat," they're probably speaking more literally than most golfers would expect. Zorro, a border collie who resides at Rolling Hills Country Club, is the club's most prized maintenance worker. Zorro – aptly named because of the mask-like marks on his face – can spend up to 45 minutes in the property's ponds, shoo-ing off geese and other unwanted waterfowl. Despite the success of Zorro and others like him in the area, some "hazards" do still exist around hiring full-time fowl abatement. Zorro will frequently play fetch with the players balls, bringing them back to the players after they hit. And the occasional – eh hem – fertilization will occasionally take place as well. However, when an employee spots Zorro partaking in voluntary spot fertilization, it is cleaned up immediately. Let's go to Fargo, where police continue to delve into a murder case that has haunted the town for nearly a month. On a fateful Tuesday night in August, the ninth hole at Rose Creek Golf Club played witness to the merciless murder of a goose. Despite intense resuscitation efforts, the goose died shortly after Wednesday's retrieval. Deeming the murder weapon a .22 caliber rifle, police say they have a suspect, according to Officer Todd Wahl. In a related story, Fargo's police department also continues to lament that the rest of the country doesn't take them seriously because of the movie "Fargo." Finally, with Team USA's trouncing in this year's Ryder Cup, I feel it is my job to talk about a few more of the BadGolf moments in the recent history of the U.S.teams. In 1985, the U.S. entered the Ryder Cup riding a 28-year unbeaten streak. On the 18th hole, Andy North, the reigning U.S. Open champion, was taking on relative nobody Sam Torrance. Apparently, no one told Torrance he wasn't supposed to win, as he drained an 18-footer on the closing hole to oust North and secure the cup for the European team. The putt snapped the United States' storied dominance of the event and turned the Cup into an actual competition instead of a Dream Team-esque exhibition. Ten years later at Oak Hill Country Club in Rochester, N.Y., the U.S. team strolled into the final day with a 9-7 lead over the European team. Most considered this a foregone conclusion. But as the day progressed, America's collective mouth gaped in awe as Peter Jacobsen lost to Howard Clark, Brad Faxon lost to David Gilford, Curtis Strange lost to Nick Faldo and Jay Haas dropped his singles match to Philip Walton, allowing the European team to earn 14.5 points and possession of the Ryder Cup. It's true. BadGolf happens to even the best.